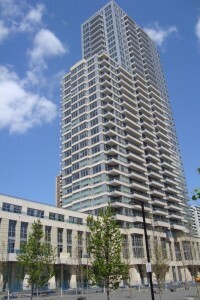 High Floor Corner Suite With Amazing North West View Brand New Suite. Never Lived In, Granite Counters, 5 Minutes to Subway, Laminate Throughout, 2 Full Baths, Master Ensuite, 9 Foot Smooth Ceiling. Amazing N/W City View. All Window Coverings Included, Smooth Ceilings, 2 Balcony’s, Over-sized Master Bedroom With Walk-Out To 2nd Balcony.